Yesterday was my birthday, and Mr. Bouillie surprised me by baking a scratch cake. Four layers of dark chocolate, filled with raspberry jam, iced with a poured, dark chocolate ganache and toasted hazelnuts–pretty impressive for a very first cake. 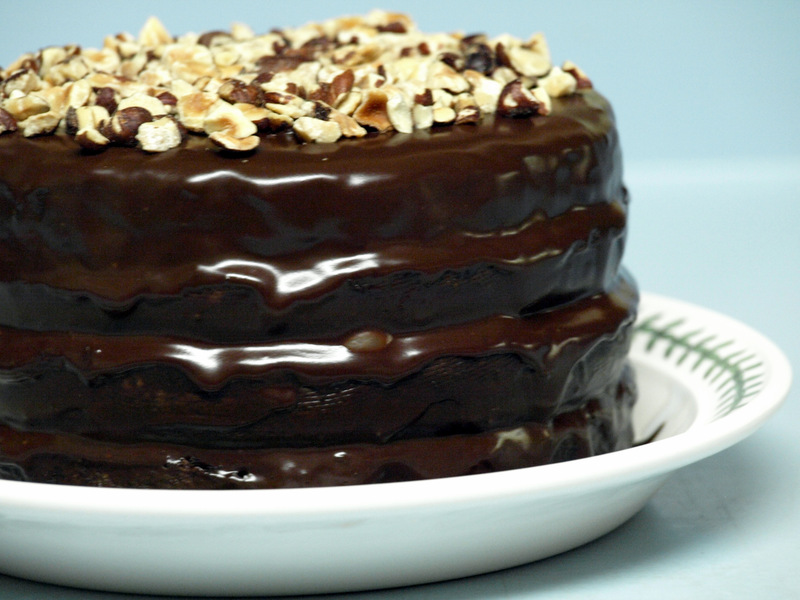 He used Dorie Greenspan’s “cocoa buttermilk birthday cake” recipe from Baking: My Home to Yours. Hmm, maybe this is the beginning of a trend away from his recent pie and more pie culinary efforts….I do like cake more than pie. We have lots of leftover ganache, so perhaps a batch of dark chocolate truffles are in order. Sounds good! Hope you had a wonderful birthday! Thanks–I did have a nice day! Thanks, JimZ….he hasn’t taken up bread-baking yet, but you never know. Great looking cake ~ Sounds delish! ~ I know your day was special!! !